Born: Granville, France, 21 January 1905. Education: Studied political science at École des Sciences Politiques, Paris, 1920-25. Military Service: Served in the French Army, 1927-28, mobilized, 1939-40. Career: Art dealer, 1928-31; freelance designer and sketch artist, 1934-37; assistant designer, Piguet, 1937-39; lived in Provence, 1940-42; designer, Lelong, 1941-46; Maison Dior opened, 1947; Christian Dior-New York opened, 1948; firm continued after death, Yves Saint Laurent took over designs, 1957-60; Marc Bohan signed as designer, 1960-89; Miss Dior boutique opened, 1967; fragrances and cosmetics sold to Moët-Hennessey, 1972; acquired by Agache-Willot; acquired by Bernard Arnault, 1984; went public as Christian Dior SA, 1988; Gianfranco Ferré became head designer, 1989; brought most licensing in-house by 1995; hired John Galliano, 1996; began opening new stores, 1999-2000; owns majority stake in LVMH; fragrances include: Miss Dior, 1947; Diorama, 1949; Diorissima, 1956; Diorling, 1963; Tendre Poison, 1994; Dolce Vita, 1995; Hypnotic Poison, 1998; Higher Dior, 2001. Exhibitions: Christian Dior et le Cinéma, Cinémathéque Francaise, Paris, 1983; Dessins de Dior, Musée des Arts de la Mode, Paris, 1987; Gruau: Modes et publicité, Musée de la Mode et du costume, 1989; Réne Gruau pour Christian Dior, Musee des Beaux Arts, 1990; Christian Dior: The Magic of the Fashion, Powerhouse Museum, 1994; Metropolitan Museum of Art, [retrospective], 1996; John Galliano at Dior, [retrospective], Design Museum of London, 2001-02. Awards: Neiman Marcus award, Dallas, 1947; Remise de la legion d'honneur a Christian Dior, 1950; Parsons School of Design Distinguished Achievement award, New York, 1956; Fashion Industry Foundation award, to the House of Dior, New York, 1990. Died: 24 October 1957, in Montecatini, Italy. Company Address: 30 avenue Montaigne, 75008 Paris, France. Company Website: www.dior.com . Talking About Fashion, with Alice Chavane and Elie Rabourdin, London, 1954. Dior by Dior, London, 1957. Keenan, Brigid, Dior in Vogue, London, 1981. Musée des Arts de la Mode, Homage á Christian Dior [exhibition catalogue], Paris, 1986. Giroud, Françoise, Dior: Christian Dior 1905-1957, London, 1987. Pochna, Marie-France, Christian Dior, Paris, 1994. ——, Christian Dior: The Man Who Made the World Look New, London, 1994, 1996. Christian Dior: The Magic of Fashion, Sydney, 1994; London, 2000. 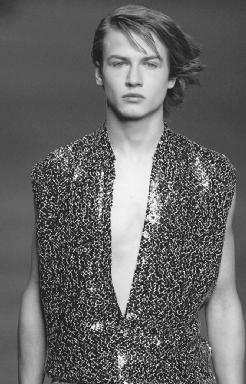 Cawthorne, Nigel, The New Look: The Dior Revolution, London, 1996. ——, Key Moments in Fashion, London, 1998. Drosson, Monique, and Lidia Popielska, Christian Dior, Marcel Boussac, 1947-1978, Alsace, 1998. Christian Dior, fall/winter 2001 ready-to-wear collection designed by John Galliano. 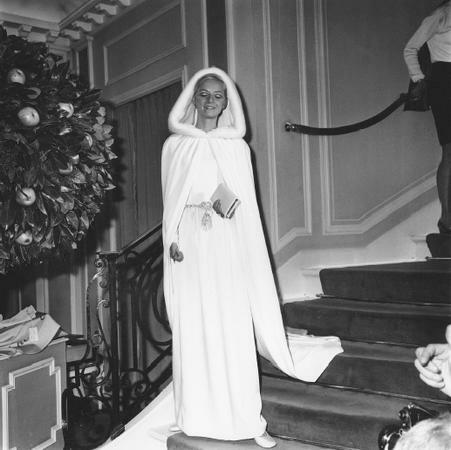 Christian Dior, 1968 collection: wedding gown and long cape with a fur lined hood. de Réthy, Esmeralda, and Jean-Louis Perreau, Christian Dior and the Founding of His House, London, 2001. McCooey, Meriel, "The New Look," in the Sunday Times Magazine (London), 11 August 1968. "Dior is Dior is Dior," in American Fabrics & Fashions, No. 114 (New York), 1978. McDowell, Colin, "Dior: The Myth, the Legend and Tragedy," in The Guardian, 12 February 1987. Buck, Joan Juliet, "Dior's New Look, Then and Now," in Vogue, March 1987. Bricker, Charles, "Looking Back at the New Look," in Connoisseur (New York), April 1987. Harbrecht, Ursula, "Hommage á Christian Dior," in Textiles Suisses (Lausanne), May 1987. Snow, Carmel, "It's Quite a Revolution, Dear Christian; Your Dresses Have Such a New Look," in the Independent, 23 October 1987. Schiro, Anne-Marie, "Color-Filled Chloé and Rarefied Dior," in the New York Times, 17 March 1995. "Designing Dior—Who's Next?" in WWD, 16 July 1996. Mehle, Aileen, "Dior New York Look," in WWD, 11 December 1996. Duffy, Martha, "The Pope of Fashion: Bernard Arnault…," in Time, 21 April 1997. Weil, Jennifer, et al., "Arnault's New Agenda for LVMH, Dior Puts Emphasis on Retailing," in WWD, 10 June 1998. Rubenstein, Hal, "The Look of Christian Dior," in InStyle, 1 November 2000. "Dior Income Rises, Galliano Sales Cited," in WWD, 12 March 2001. Deeny, Godfrey, "Christian Dior: Too Many Clothes, Not Enough Models," at Fashion Windows, www.fashionwindows.com , 7 July 2001. Davis, Boyd, "Christian Dior á la America," at Fashion Windows, www.fashionwindows.com , 9 October 2001. Although Christian Dior died in 1957, he is perhaps one of the most famous fashion designers of both the 20th and 21st centuries. In the years after the debut of his first collection in 1947 he was a legendary figure and the world press developed an extraordinary love affair with him, increasing their enthusiasm with each new collection. Dior never disappointed them, constantly creating clothes that were newsworthy as well as beautiful. Dior was middle-aged when he achieved fame. A sensitive and gentle personality, he had previously worked as a fashion illustrator, then as a design assistant for both Robert Piguet and Lucien Lélong in Paris. In 1946 the French textile magnate Marcel Boussac offered to finance the opening of Dior's own couture house and secured the lease on 30 avenue Montaigne, Paris. The first collection was revolutionary, heralded as the "New Look" by the fashion press— Dior himself had christened it the "Corolle Line." It was a composition of rounded shoulders, shapely emphasis of the bust, cinched waist, and curvaceous bell-shaped skirt in luxurious fabric. The concept of the collection was not new, bearing a striking resemblance to French fashions of the 1860s. Dior himself attributed his inspiration to the pretty, elegant clothes he had remembered his mother wearing to the Deauville races in the 1900s. Even though several other designers had experimented with or predicted the new silhouette, Dior's luxurious version reawakened the world to the importance of Parisian couture. At a standstill during World War II, Paris had lost its way as the world's fashion capital. Dior reestablished it as a center of excellence, creating what Janey Ironside of the Royal College of Art in London described as "a new chance in life, a new love affair." There were many criticisms of the New Look; feminists have argued it was an attempt to return women to an oppressed, decorative role with its emphasis on the restrictive padding, corset, and crinoline. Christian Dior, fall/winter 2001 collection designed by Hedi Slimane. Others were shocked by the extravagant use of ornament and fabric when clothes were still being rationed. The New Look, however, rapidly became a postwar cultural symbol for what Dior himself described as "Youth, hope, and the future." After creating a furor with his first collection, Dior established himself as a cautious, methodical designer. Subsequent collections were a continuation of the New Look theme of highly constructed clothes. They were christened with names that described their silhouettes, the Zig Zag Line, A Line, Y Line, Arrow Line, etc. All the collections were realized with the finest tailoring and the most sumptuous fabrics: satins, traditional suiting, fine wools, taffetas, and lavish embroideries. Throughout Dior's ten years of fame, none of his collections failed, either critically or commercially. The only threat to his run of success occurred when Chanel made a fashion comeback in 1954 at the age of 71. Chanel's philosophy—clothes should be relaxed, ageless, dateless, and easy to wear—completely opposed Dior's philosophy. "Fifties Horrors," was how she described male couturiers, deploring them for torturing bodies into ridiculous shapes. Dior's reaction was to introduce his most unstructured collection, the "Lily of the Valley" line was young, fresh, and unsophisticated. Relaxed, casual jackets with pleated skirts and sailor-collared blouses, these Dior clothes were easy and beautiful. By the time Dior died his name had become synonymous with taste and luxury. The business had an estimated turnover of $20-million annually, a phenomenal figure in those days, thanks in part to Dior's own shrewdness. Dior organized licence agreements to manufacture accessories internationally, and at the time of his death, perfume, furs, scarves, corsetry, knitwear, lingerie, costume jewelry, and shoes were being produced. Many of Dior's associates have said that his death was timely and that his work and fashion philosophy were entirely suited to his period. It would be interesting to speculate how Dior would have adapted to the excesses of fashion in the 1960s, 1970s and 1980s, because, as his former personal assistant, Madame Raymonde, once said, "If Dior had lived, fashion would not be in the state it is in now." Nor would his business have gone through multiple owners, or his name become so overlicensed its cachet was nearly lost. After years of struggle, the Dior reclaimed its licenses and rebuilt an empire in the capable hands of Bernard Arnault who bought the firm in 1984 from its bankrupt owner, Agache-Willot. Many top designers have had stints at Dior, including Yves Saint Laurent who took over after Christian's death, followed by Marc Bohan, Gianfranco Ferré, and John Galliano. Galliano's bad-boy image brought much attention to Dior, but his designs have reinvigorated the house and once again brought renown to the Dior name.